← Who Can Make Use of First Aid? 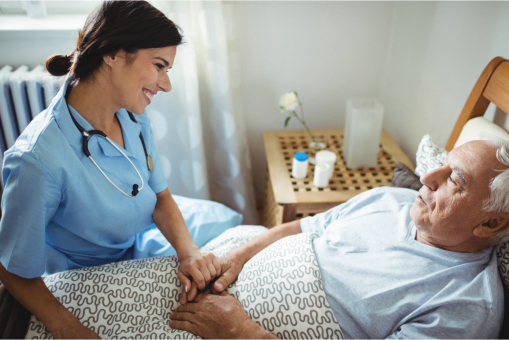 Seniors who are in need of home and health care can greatly benefit from the services of a certified nursing assistant since they are more knowledgeable about care instructions and are certified to execute proper care procedures to their patients. We provide a short yet comprehensive CNA / LPN Program in Illinois to give aspiring individuals a licensed option for their nursing careers. Our training programs help bring back the trust of clients that home care services are dependable and help extend the love of families to their aging seniors. When your care provider received their Healthcare Training in Dolton, Illinois, you can have complete confidence that our nursing assistants are skilled and capable of giving you the attention you need for your homebound loved one. We make sure that all the knowledge and skills acquired from our training is up-to-date and will complement modern-day challenges and requirements of clients so that our CNAs can readily perform basic health and medical services when needed. Having a CNA take care of your senior loved one at home or at a care facility will give you more peace of mind since our CNAs have more in-depth understanding toward patient conditions and related discomforts that bring about irritability and changing temperaments. You do not have to worry about a caregiver getting affected by an irrational outburst from your loved one because of their dementia or their current health condition. Our CNAs receive proper training to handle different patient conditions and are also reminded to take good care of themselves so they can deliver the best care they possibly can. We carefully screen our CNA applicants and make sure they are absolutely qualified for the care responsibilities and are oriented to maintain physical and mental fitness so they can always deliver dependable care services to all their future patients. Families need to know that there is better care out there and this care comes from those who have undergone training and Nursing School in Illinois so they can be better at their careers and provide well-rounded health care services. Interested in becoming a Certified Nursing Assistant or a Licensed Practical Nurse? Click here and know more about Adonis College of Nursing (USA). This entry was posted in Certified Nursing Assistants and tagged Healthcare Training, Nursing School, skilled nurses. Bookmark the permalink. Youre so cool! I dont suppose Ive read something like this before. So nice to find any person with some unique ideas on this subject. realy thanks for beginning this up. this web site is something that’s wanted on the internet, someone with a little bit originality. helpful job for bringing something new to the web! Thank you for all of the hard work on this web site. Gloria really loves managing internet research and it’s easy to understand why. A number of us notice all of the compelling mode you create reliable ideas through your web blog and even encourage participation from others on this concept so our girl is without question understanding a whole lot. Have fun with the rest of the year. Your conducting a really good job. I really wanted to jot down a simple word to thank you for these awesome hints you are giving at this site. My prolonged internet research has now been honored with reasonable insight to share with my classmates and friends. I would say that many of us website visitors are extremely blessed to be in a great place with very many perfect professionals with valuable methods. I feel really grateful to have seen your website page and look forward to so many more entertaining moments reading here. Thank you once more for a lot of things.